ACF-50 aerosol is 95% product, hence virtually no propellant. Keep the tin in a warm environment, shake very well before use and remember a little ACF-50 goes a long way, so keep a rag handy to soak up any excess - then use the rag to help spread the product. ACF-50 has strong capillary action so will creep into all the areas that moisture can, 'actively' pushing out moisture and replacing it with protection. Go cautiously when applying to callipers to ENSURE YOU KEEP IT OFF THE BRAKES. 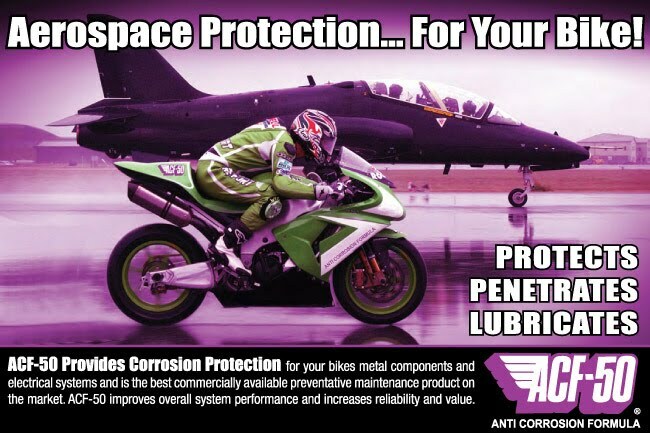 Use ACF-50 anywhere, except the brakes, on your bike including the engine and exhaust (will smoke on first start and burn off down pipes but still slows down corrosion process). Safe on paintwork, most rubbers and brings up black plastic trim a treat. ACF-50 contains no water and is approved for electrics so spray directly into electrical joints and components where it will prevent corrosion induced failures and high resistance joints. Works well at stopping dirt, mud and road gunk from sticking. You can come back from a winter ride with a quick hose off and all the mucks gone with the bike still protected. Areas not in direct contact with the elements ie tank/seat areas, electrics require treating approx once a year. Other exposed areas re-apply as necessary. You can tell the product is still 'Active; as water will bead on contact...having no water content and not being water soluble ACF-50 only dissipates by being 'sacrificial' whilst stopping existing or new corrosion so just re-treat as required. Take a look at the video at the bottom of this page to give you an idea on how to wash and treat your ride.